Fractal Noise does EVERYTHING in After Effects! 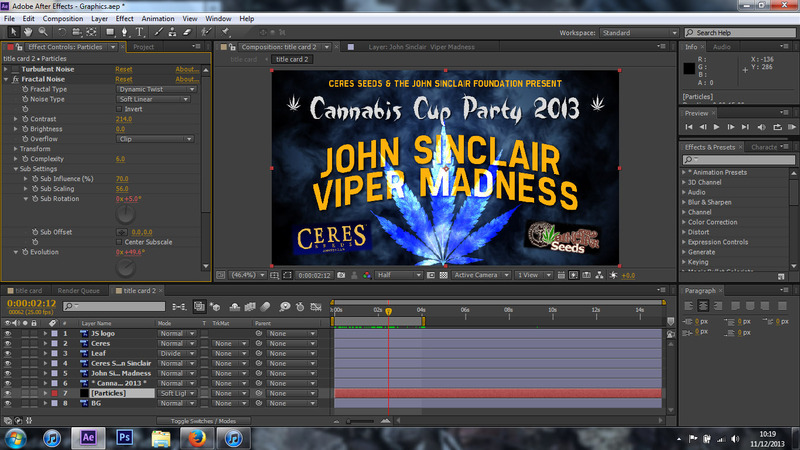 After finishing up the multi-camera edit of the John Sinclair Viper Madness video the other day, I have moved on to creating the graphics; title card, lower 3rds and credits in After Effects. I've used After Effects for about 7 years now, since CS3 so I've got to see it develop and grow over the years, just as my knowledge in motion graphics has too. I always find, if you're trying to create some kind of animated texture, no matter what it is, Fractal Noise will always have a solution. To animate the title card, I added the Fractal Noise effect to a solid layer and changed the parameters so the fractal resembled smoke, using expressions to control the evolution over time. The result is perfect, simple and easy! Newer PostInterview with John Sinclair and new Manfrotto gear!